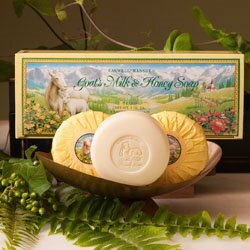 Of the many luxurious bath and body products for which Caswell-Massey has become justifiably famous, perhaps none are more distinctive than their extensive line of wonderful soaps. Choose from dozens of legendary and luxurious bath soaps, each triple-milled for a generous, consistent lather and lasting performance from the first use to the last. Select from classic soaps such as Dr. Hunter's Castile Soap - offered since the 1800's! - or choose sensual Sandalwood, with its distinctive wood-grain appearance and irresistible scent. Fresh, lightly scented Almond & Aloe has been used in The White House as its official soap. Whatever your taste, every Caswell-Massey soap is made in the USA of top quality ingredients to gently cleanse and leave your skin perfectly balanced and lightly fragrant.